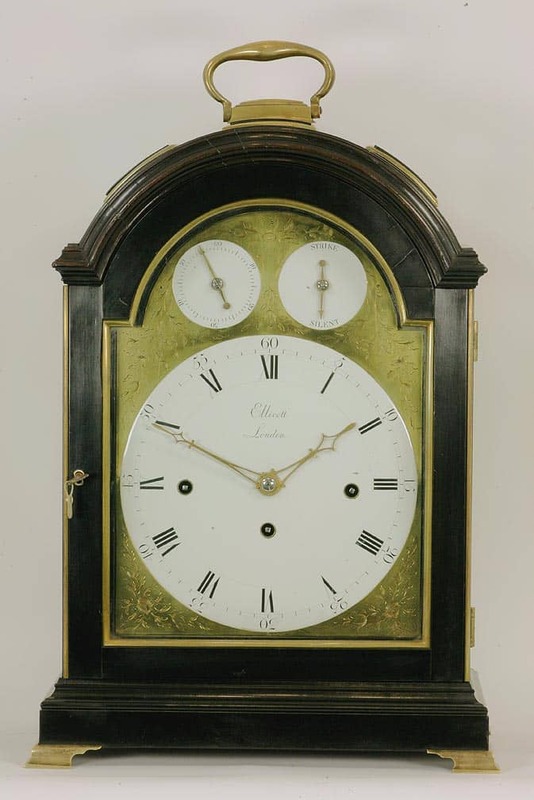 AN ELEGANT TRIPLE PAD TOP EBONY QUARTER STRIKING BRACKET CLOCK WITH ENAMEL DIALS. CIRCA 1780. 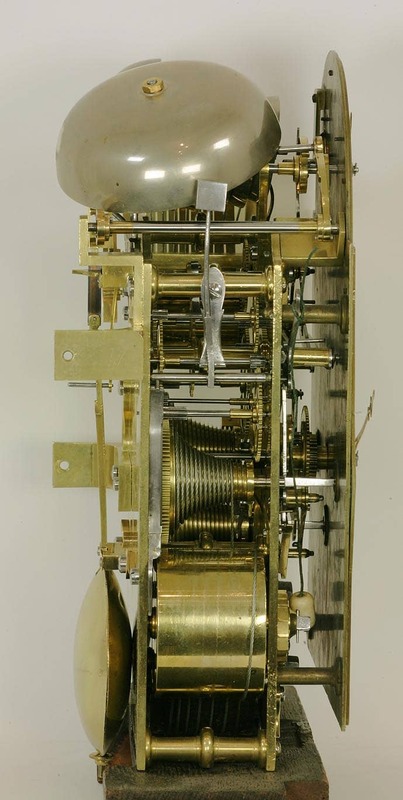 A very attractive quarter striking bracket clock by this famous maker. The triple pad case is veneered partially in ebony with some ebonised fruitwood. The case is surmounted by a brass carrying handle and the three pads are brass edged. There are brass fish scale frets to the side and the front door has brass edging to the glazed panel. Both front and rear doors have brass edging at the side. The clock stands on cast brass ogee shaped feet. The brass break arch dial has floral engraving to the corners and in the break arch, and has inset enamel dials. The two small dials in the arch being for strike silent and for pendulum regulation. 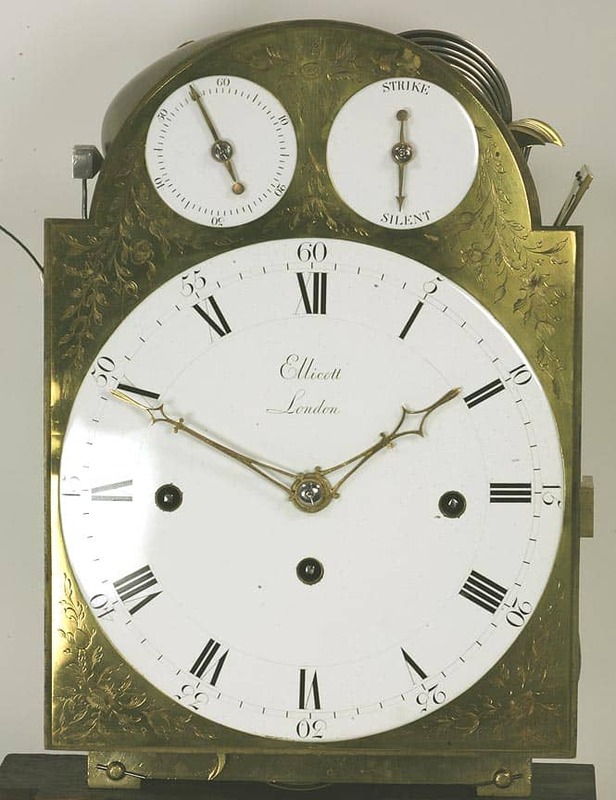 The main dial is also enamel and is signed for the maker ‘Ellicott, London’. It has Roman hour numerals with Arabic minute numerals. The well fretted hands are of gilded brass. The eight day quarter striking movement strikes the quarters on a nest of eight bells mounted above the plates with eight hammers. It further strikes the hour on a large bell also mounted above the plates. The movement is signed on the backplate for the maker ‘Ellicott, London’ and has edge engraving. 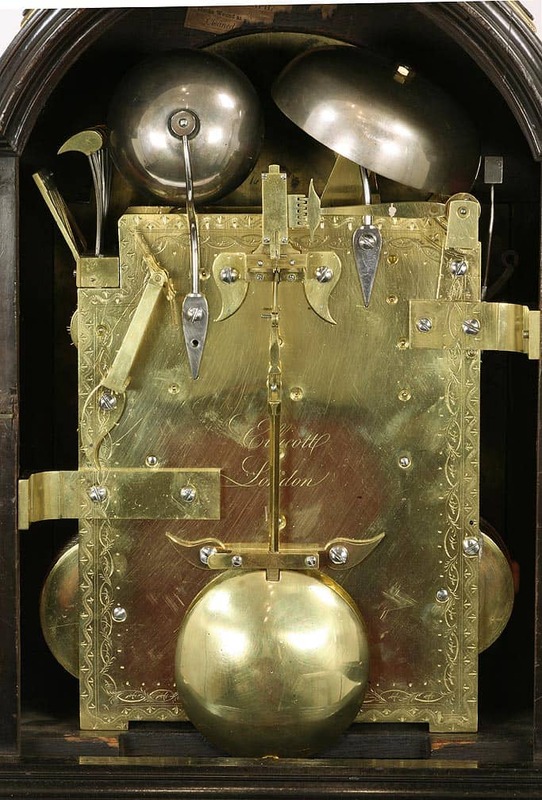 The pendulum has the toothed rise and fall mechanism at the top and has a clamp for transit below the maker’s signature. John Ellicott was born in 1706 and died in 1772. He was a Fellow and on the Council of the Royal Society and is noted as one of the most eminent English makers. 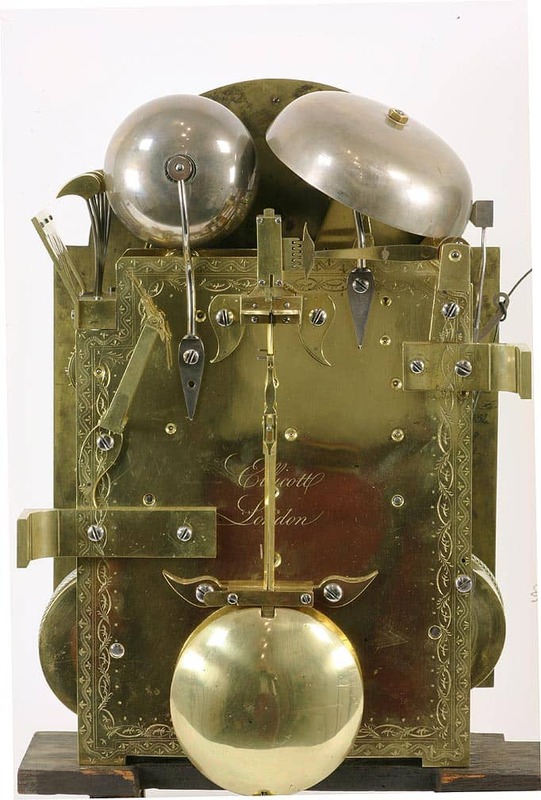 He invented a compensated pendulum and developed the use of the cylinder escapement and became Clockmaker to the King. 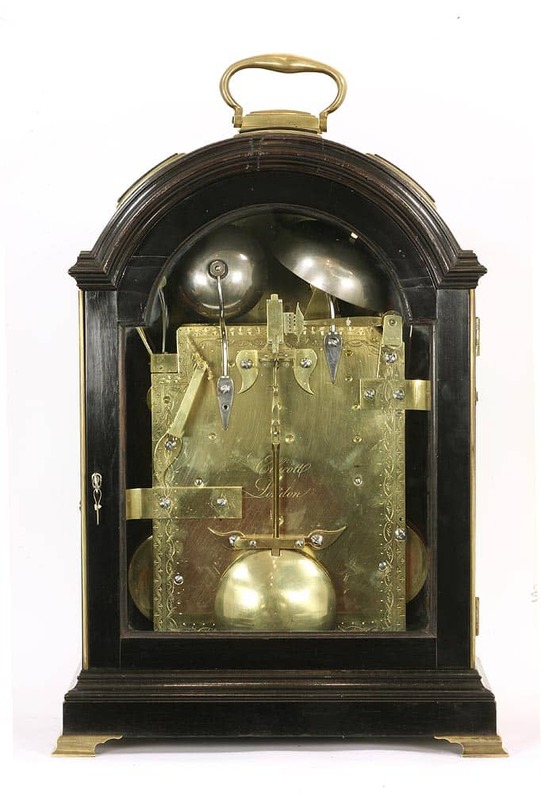 There are many fine clocks by this maker in various collections. By 1758 he had been joined in the business by his son, Edward, by which time the signature ‘Ellicott’ without the christian name was often used, although some items were signed ‘John Ellicott & Son’.